Every four years, experts from all over the world come to Düsseldorf, Germany, to visit the trade fairs GIFA, METEC, THERMPROCESS in order to get the latest of information about new technologies and solutions in all areas of metallurgy. The three fairs will take place from 25 to 29 June this year under the motto “The Bright World of Metals”. Again, the organizers expect about 80,000 expert visitors to the event. 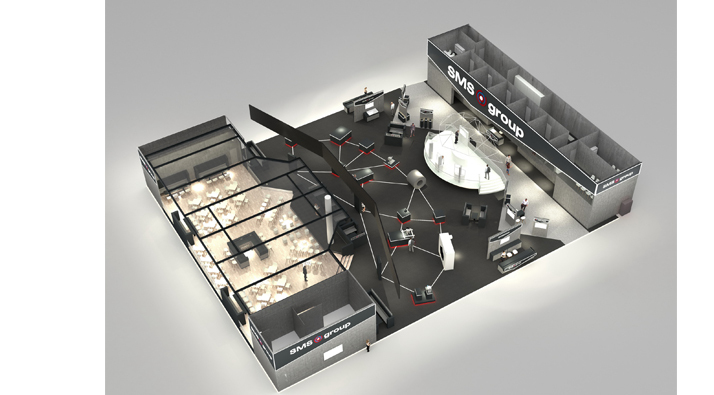 Being one of the leading suppliers of metallurgical systems solutions for the steel and non-ferrous metals industry, SMS group will participate with a trade fair booth covering a total floor space of 1,200 square meters. At SMS group’s METEC booth in hall 5 (5/E22), visitors will get first-hand information about the entire technology and service portfolio offered by SMS group. Additionally, at ESTAD 2019 (European Metallurgical Steel Technology and Application Days), SMS group experts will be presenting new developments and successful reference projects accomplished during the last few years in more than 60 technical papers. The ESTAD 2019 conference will be held at the Congress Centrum Düsseldorf (CCD) from 24 to 28 June 2019. SMS group is a trailblazer in digitalization for plant and equipment used in steel and NF-metals production and processing. At METEC, the company is going to demonstrate by way of examples of projects implemented at its customers how networked systems, self-learning process models, smart assistance systems, artificial intelligence and virtual reality have revolutionized engineering, production and maintenance in steelworks and rolling mills and how its customers benefit from a stronger competitive standing as a result. With its holistic approach to process control along all stages of the supply chain – as in the learning steel mill – SMS group builds not only highly efficient new production facilities, but it also upgrades existing ones to a state that compares with that of brand new plants. Against the backdrop of constantly decreasing resources of metals that are crucial for the application of new technologies – such as nickel, cobalt, aluminium oxide, titanium, vanadium, lithium or rare earths – SMS group has developed new, profitable processes for the extraction of metals from secondary sources and sources that could only be exploited with limited efficiency in the past. Besides that, SMS group designs resource-saving, integrated plant solutions for primary and secondary process routes in non-ferrous metals production within the joint venture PolyMet Solutions. The Luxembourg SMS group company Paul Wurth develops new CO2-free steelmaking techniques that make for a significantly smaller CO2 footprint of the steel industry. Cooperating with Sunfire, a company based in Dresden, Germany, Paul Wurth is taking a direct reduction process to market maturity, in which the fossil element carbon is substituted with hydrogen, and from which no climate-damaging CO2 arises, only water vapor. In this context, Paul Wurth also engages in the research of systems for the production of green hydrogen, which is produced exclusively with renewable energy. In a cooperation with UrbanGold GmbH from Austria, SMS group has developed an economically efficient process able to recover and feed back into the raw material cycle high-grade, valuable materials previously considered as lost materials from electric and electronic scrap – e.g. gold, silver, platinum, nickel or copper. A first plant for the recycling of electronic circuit boards will be started up shortly.